For two local artists, the year is ending in fine fashion, and the next will begin full of promise. 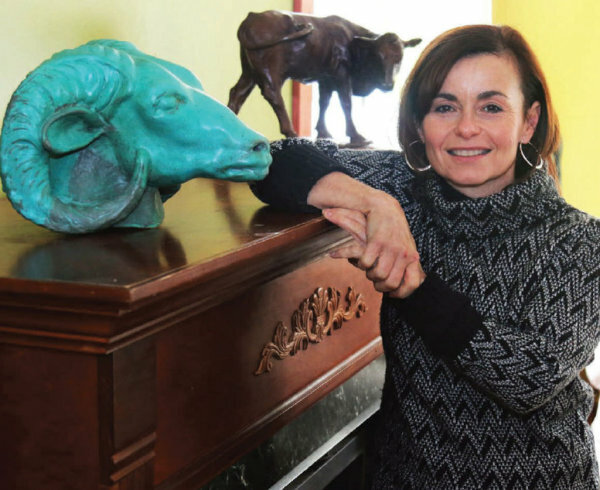 Sculptor Serena Bates of Westerly and painter Diane Brown of Stonington, two well-established and well-known area artists, have had a year filled with accomplishments and awards. 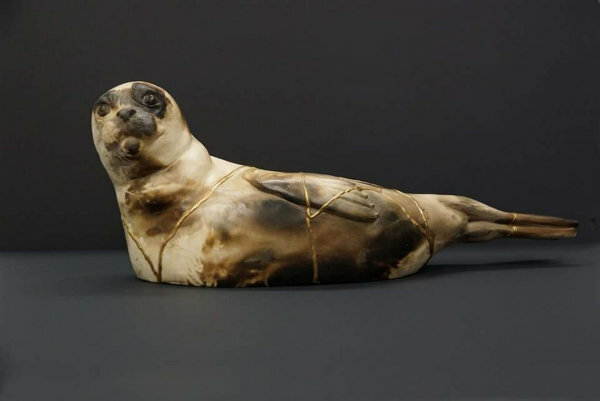 Next month, both of them will head to New York together to display their work at the show opening at Catherine Lorillard Wolfe Art Club, the oldest women’s art club in the country. Their work will be on display at the 121st Annual Juried Exhibition at the National Arts Club in Gramercy Park from Jan. 9 through Jan. 26. The American Artists Professional League (AAPL) has announced Serena Bates of Bradford, Rhode Island as the 2017 recipient of the "Helen G. Oehler Memorial Award" at the AAPL 89th Grand National Online Exhibition. The award was presented by AAPL President Peter Rossi on Saturday, November 11, 2017 during the AAPL annual meeting and awards reception in New York City. Ms. Bates received the award for her ceramic sculpture entitled "Survivor" which was chosen from 34 works in the Sculpture category. "The AAPL is dedicated to encouraging and promoting traditional, realistic art, and we are extremely proud to recognize some of America's finest artists today," said Peter Rossi. "Our award winners' work epitomizes the quality of art that our organization strives to support." The non-profit AAPL has been devoted to the cause of fine arts in America since 1928. Each year, the organization hosts its Grand National Exhibition, a show that highlights major and emerging professional artists in oil, watercolor, pastel, sculpture, graphics and mixed media. Entries are received from all 50 states as well as internationally and judged by a selection committee consisting of professional artists. This year, the American Artists Professional League's 89th Grand National Exhibition highlights the achievements of 292 artists. The AAPL is headquartered at the Salmagundi Club Galleries, 47 Fifth Avenue, New York New York 10003. To view AAPL 89th Grand National Exhibition online through December 29, 2017, please visit the AAPL online. Serena has been asked to join the Board of Directors for the Lyme Art Association in Old Lyme, Connecticut. Lyme Art Association was established in 1914, with roots going back to 1902. The organization maintains a historic art gallery located at 90 Lyme Street in Old Lyme, Connecticut, located in the Old Lyme Historic District. 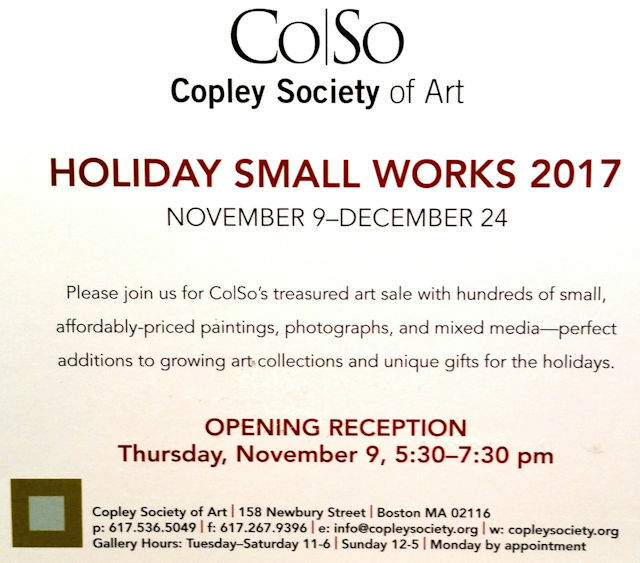 BOSTON MA: Serena is honored to have been accepted into the Copley Society of Art in Boston. Her work is in the holiday Small Works show at the Society from November 9th through December 24th, 2017. So, if you're looking for a great gift and happen to be in Boston, stop by 158 Newbury Street and do some holiday shopping.